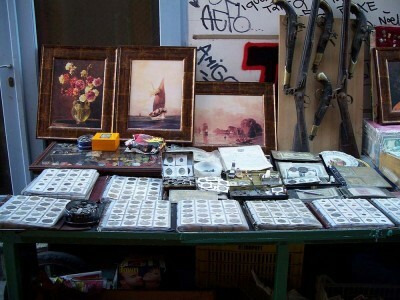 Street vendor table with coins, guns and pictures. The Monastiraki is a flea market area in Athens. It gets its name from the monastery in the city’s Plateia Monastirakiou. The Monastiraki is situated east of ancient Agora, north of the Acropolis, and west of the National Gardens. It is surrounded by Sari street in the west and Aiolou street in the east. The roads around the Monastiraki are filled with shops that sell all kinds of merchandise every day of the week. The shopper can find treasures among the antiques, leather, books, coins, artwork, rugs, tools, furniture and silver. The heart of the Monastiraki is found in Plateia Avyssinias, which attracts junk dealers every morning. Among the odds and ends and bits of furniture shoppers can find some treasures. 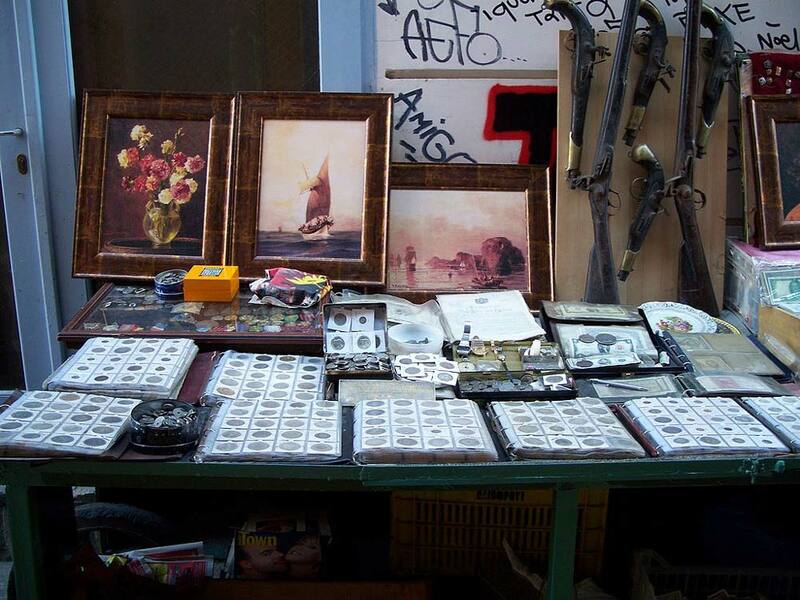 The best buys can be found along the Adrianou and Plateia Agiou Filippou streets. While shopping, visitors will be entertained by clarinet players and other musicians that play in the crowded streets. They can also quench their thirst with salepi, a sesame seed tea offered by street vendors. Greek vendors like to bargain, so the tourist should be ready. Never buy anything for the price the vendor asks for right off the bat because the price is inflated. Despite the hustle and bustle, tourists can be sure of their safety, as the police are plentiful and watchful. They are also the people to go to if a passport, credit card, traveler’s check or other necessity is lost or stolen. The Monastiraki is easily accessible by public transportation. Just take the 1 or 3 train and get off at the Monastiraki Metro stop.